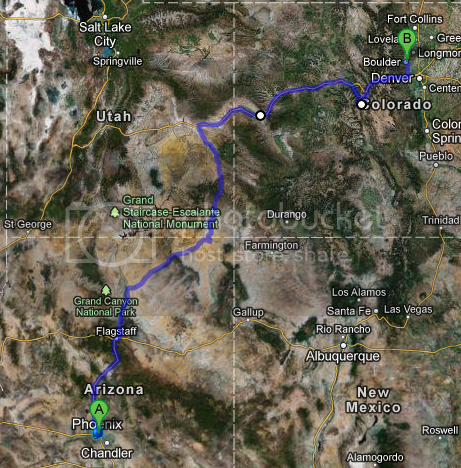 Boulder/Breck/Grand Junction/Fruita/Moab end of September? Discussion in 'The Lounge' started by DirtMcGirk, Jun 1, 2012. My younger brother is getting married in Boulder the end of September. I was thinking this would make a great time to get a bike road trip in. I've not done these parts of the world late in the season like that. Think I need to worry about weather at that point? I was thinking I could make a pretty good road trip out of the deal, could bring the XC, the DJ and the DH bikes. Anything I need to worry about other than riding myself into the ground or running out of beer in Utah? I don't think you need to worry about or change anything! That sounds awesome! How long would the whole thing last? The mountains will be starting to get a little cooler then, but the weather is generally very nice up there that time of year. I think Buffalo and I are trying to get out that way for a wedding at the end of Sept--we'll let you know when we know more! Durango! I've also heard tell of some awesome riding near Gallup. It will be on the colder side, but the higher stuff in CO should still be OK. Unless Ullr plans on answering my plea's this year. Oh - and the desert location should be *perfect* at that time... you gonna do The Whole Enchilada this time?? Yes sir, part of the master plan.